This patriotic star quilt with a lovely swag border is from the Quilt Show. The flag quilt above was shown at the June meeting of the Utah Valley Quilt Guild. 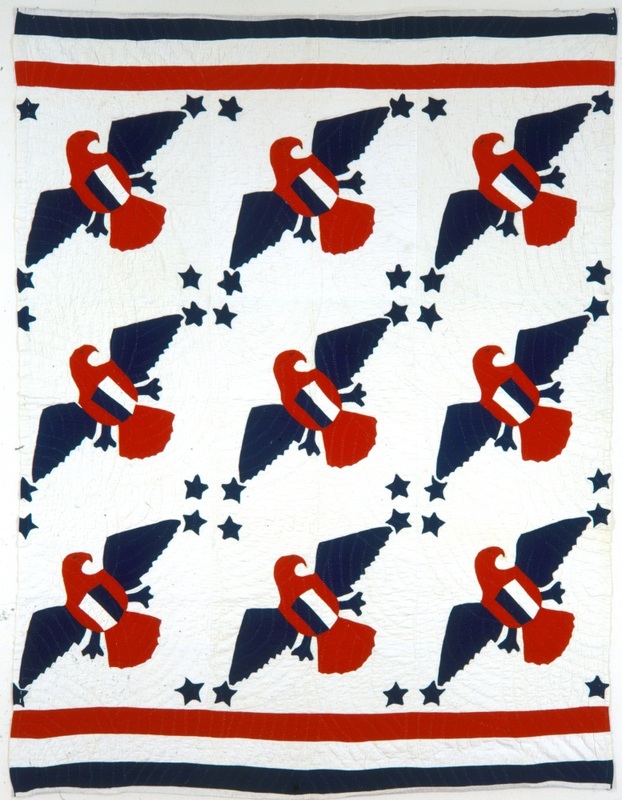 This eagles quilt was made by Elizabeth Stauf. She came to the US from Switzerland at the age of 18 in 1878. She made this quilt before the start of WWI It belongs to the Kansas Historical Society. 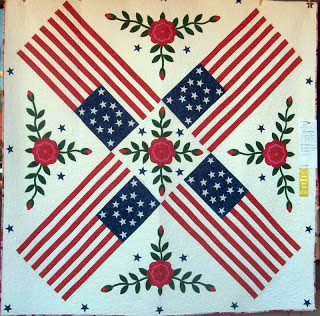 This stunning flag and rose quilt was exhibited at the Sisters, Oregon quilt show in 2010, and was featured on the Humble Quilts site. The maker's name wasn't provided. It looks like it won a yellow ribbon. The elements in this quilt are so well balanced, and the design is so crisp and clean. The navy stars sparkle, don't they? I love this one. P.S. This pattern is called Patriotic Rose by the City Stitcher. Thank you to Linda for this info! 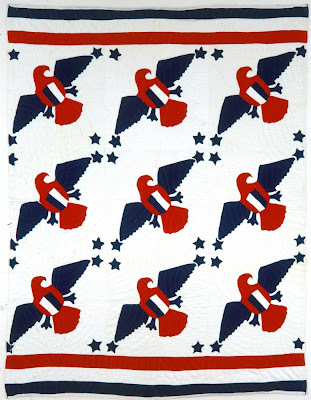 Great Examples of Patriotic quilts. Thanks for sharing. What an amazing and beautiful job. I must say it is the quilt that tops the patriotic class of quilts. Thank you so much for sharing this photo. 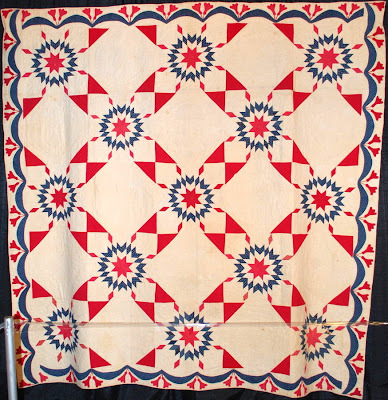 That last quilt is called Patriotic Rose, a pattern by The City Stitcher Quilt. I know because I too have made it. Thanks for the info, Linda! I've added it to the post. I would REALLY love to have the quilt pattern that is second from the top. I have searched the net and the only information that I can find that is helpful is that it may have come from a magazine. I would appreciate any help any one can give. I'm the Historian for the Utah Valley Quilt Guild this year, and we had a question from another quilter recently about this same flag quilt. After doing a bit more searching on Google and Pinterest, I came across the exact quilt! 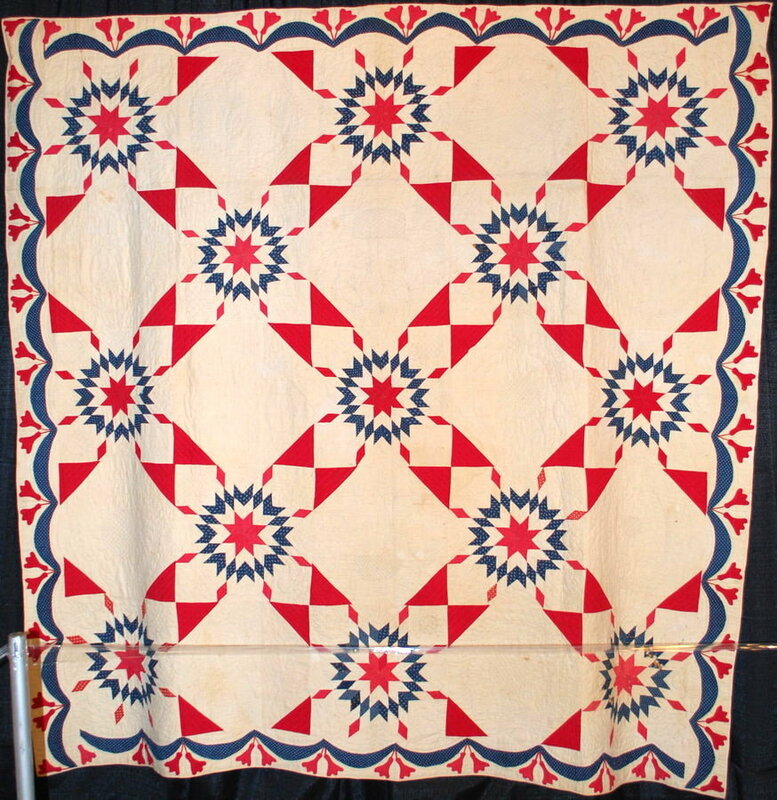 The quilt is called "Star Spangled" and it was designed by Brick Cottage Quilts, based out of Texas. The quilt was seen in the 2011 June/July issue of Quilt magazine (which I believe is out of business now), but the pattern is available on the Brick Cottage Quilts website http://www.brickcottagequilts.com/Shop.html. There is also a twin-sized quilt (with options for queen or king sizes) in the same pattern called "15 Stars" that is also available there.